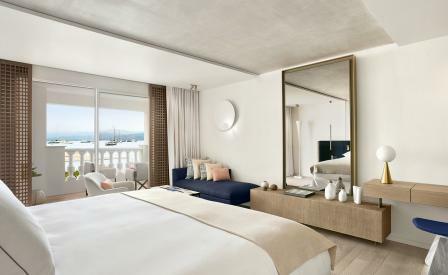 A favourite of Saint-Tropez’s jet set since opening in 1936, the Résidence de la Pinède – now under LVMH management – has just emerged from a thorough makeover courtesy of architect Jean-Michel Wilmotte. Original Provencal-style balustrades and the spruced-up peaches-and-cream exterior, are in perfect sync with the collection of 1950s and 60s vintage ceramics, low tables and hand drawn woven rugs by Vallauris artist, Roger Capron. Meanwhile, upstairs, each of the sea-view rooms mirror their setting in an understated medley of sandy beige and cobalt blue, with floor-to-ceiling pressed oak cabinets, custom furniture and gleaming marble bathrooms. The white-on-white Guerlain Spa features a chilled ‘perfume cellar’ which showcases crystal-domed fragrances, and dinner is served under the wind-swept pines at the three Michelin-star restaurant La Vague d’Or. Here, chef Arnaud Donckele unfurls his exquisitely nuanced, deconstructed modern French cuisine, from scarlet prawns seared with grapefruit to a rose-spiked lychee and frozen nougat dessert.